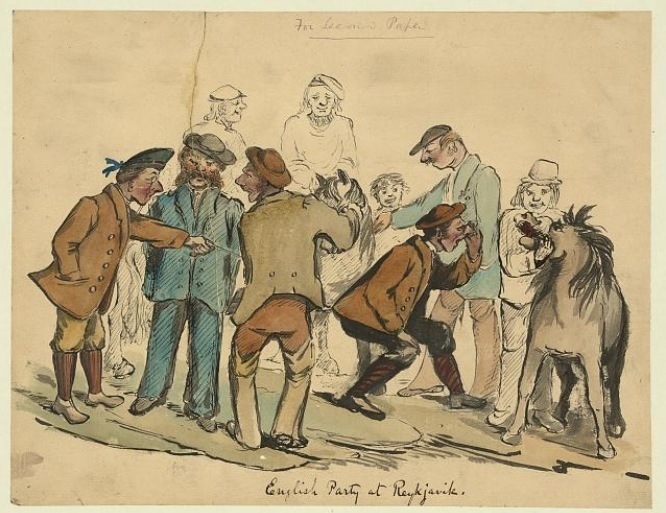 Englishman Charles Taylor visited Iceland in 1862 and recorded his impressions of the local beasts, seen here in Reyjavik. Full details at the US Library of Congress’ excellent, generous website. We talk very easily about “a gene for this” or “a gene for that” but most of our characteristics have more complex biological origins than a single strand of DNA. That’s perhaps why it’s such a surprise to read this story, which my brother, Sarah Everts and Christine Wilsdon all sent me. To look at this in more detail, the team started by doing an association study involving 30 Icelandic horses that could walk, trot, gallop, and amble or “tölt,” and another 40 Icelandic horses that could do those four and move at the two-beat pace gait. 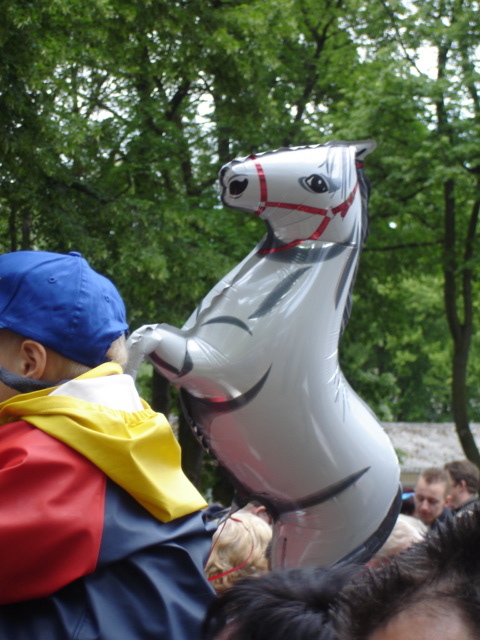 Amongst the horses capable of pacing, the researchers found a significant association involving a region on chromosome 23. 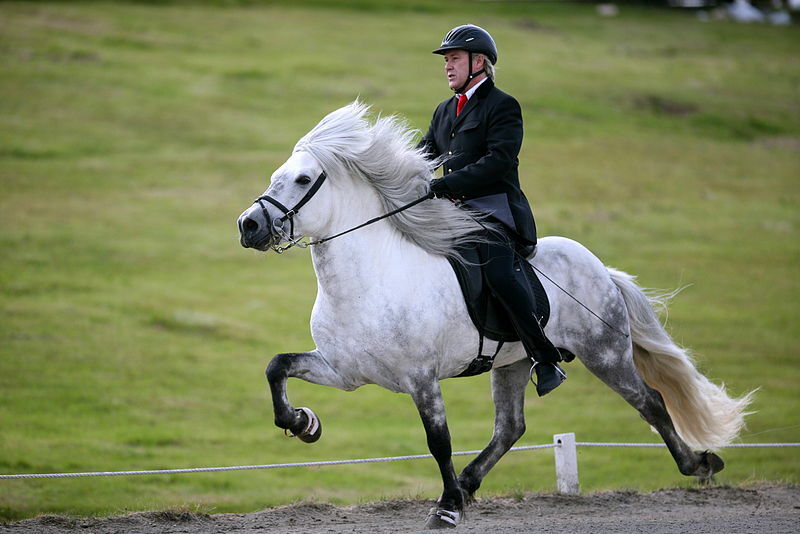 More extensive analyses indicated that five-gaited Icelandic horses typically share several SNPs in the region, including a nonsense mutation that introduces a premature stop codon in DMRT3. When the team screened hundreds more Icelandic horses, it identified the same alteration affecting both copies of the DMRT3 gene in almost all of the five-gaited horses tested. In Icelandic horses with four gaits — those that could tölt but did not perform the pace gait — the DMRT3 mutation was still more common than it is in many other horse breeds. But the change was far less likely to be homozygous. The nonsense mutation in DMRT3 turned up in some other breeds too, the researchers reported, though it tended to be more common among those with uncommon gaits and in breeds developed for harness racing, consistent with the notion that DMRT3 function contributes to the way coordinated movement is controlled. By contrast, it’s absent in all horses that stick to the standard walk, trot and gallop. Thoroughbreds, Shetland ponies, wild Przewalski’s horses—all of them have unabridged DMRT3 proteins. The conclusion is stark: for a horse to move beyond its three natural gaits, it needs a stunted version of the DMRT3 protein. … [Mice with the mutation] walked normally, but the coordination between their legs broke down at high speeds. The same is true for horses, and explains why the DMRT3 mutations are almost non-existent in the wild. Carriers find it hard to transition from trots and paces to full-blown gallops. They lack the coordination necessary to pull off the fastest gait, and predators would easily have removed them from the gene pool. Humans were kinder, and saw a different sort of potential. Andersson imagines that early humans noticed that some horses could move in unique ways, and selected them for breeding, perhaps because they offered a smoother ride or were more versatile at intermediate speeds. Certainly, these animals also do very well in harness-racing, where trotting horses are disqualified if they break into a gallop. In our stables and tracks, an otherwise debilitating mutation has found a comfortable home. The almost unbelievable discovery of fossil footprints of three Hipparion horses [in Tanzania] from the middle Pliocene (3.5 million years ago) has provided ample confirmation of the speed and agility of these grasslands adapted horses. … A subsequent analysis of the horse footprints makes a convincing case that these Hipparion horses traveled at a good clip utilizing the gait known as the running walk – the characteristic gait of Tennessee walking horses, Icelandic ponies, and paso finos, in which the length of stride is extended and only one or two feet are in contact with the ground at any given time. Comparison of the the fossil footfalls wih the footfall patterns of Icelandic ponies suggests that one of the Hipparions was traveling at 15 kilometers per hour. 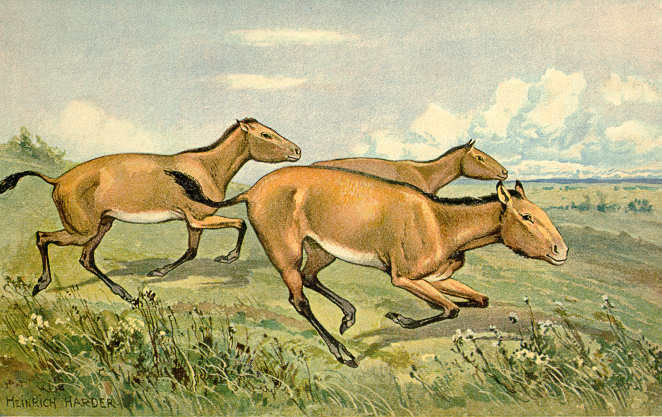 Hipparion is a relative of the modern horse, but not an ancestor. According to Wikipedia, it existed for 22.219 million years, which really ain’t bad for a runty little gaited horse.